In this episode's discussion we have multiple topics ranging from the financial decline of the cabal's money scheme, to more bizarre facts about the planetoid Ceres, along with further signs that the cabal's propaganda machine is grinding to a screeching halt. There is even a detailed analysis and scientific proof which reveal the need for reexamination of many understudied, scientific principles, as well as one particularly strange public spectacle created by NASA which hints at some type of UFO disclosure which may take place in the near future. This episode was packed with detail, and there is much to discuss on each of these topics. The discussion starts off with the point that during this time last year, the soft disclosure script had picked up significantly. Around the midpoint of last year, we saw the cabal crumbling to pieces. We witnessed their financial system failing, their Vatican powers restructuring in major ways, and we saw the Alliance dealing blow after blow upon what remained of the cabal's infrastructure. We would see this gang of criminals backed into a corner with no other cards to play other than the desperate attempt at saving their own image just prior to their utter defeat. We would also see the subject of space visited and revisited by the corporate media, and each time this happened, more and more information would be handed out to the public. David Wilcock has discussed in previous episodes how the planetoid Ceres has been the subject of great interest for astronomers. As it turned out, the subject of this planetoid would be revisited, as NASA continued their slow and yet obvious reveal of the long-hidden evidence of E.T. life. The story comes to us from the Huffington Post, and details the fact that the famed bright spots on Ceres still hold more mystery than previously disclosed. NASA’s Dawn spacecraft captured the image on May 16, as it was orbiting 4,500 miles above the planet’s surface. It had entered orbit on March 6. The space agency says the crater that harbors the bright spots is about 57 miles wide. Scientists have been aware of the phenomenon since the Hubble Telescope captured images of Ceres in 2004. As the resolution of the photos taken has increased, so too has the curiosity of astronomers. Current theories to explain the spots include ice — potentially exposed by the impact of another celestial object, or perhaps spewed out by some sort of icy volcano or geyser — or salt deposits. “We have these bright spots that have the reflectivity of ice, and whose spectrum of reflected light is similar to that expected from ice. So ice is a good bet,” said UCLA astronomer Christopher Russell, principal investigator for the Dawn Mission, in an email to NBC News. These spots on Ceres may be the partially-exposed rooftop of an illuminated, translucent ceiling, according to Wilcock. We see this collection of bright spots, as well as a number of semi-geometric craters on the surface of this moon. As we may remember from the accounts of various insiders which Wilcock has previously revealed, these moons and planetoids house technologically advanced structures which were built by the Ancient Builder Race. This particular base on Ceres is thought by some to include a sky-dome of some kind. This dome would include a large, natural environment complete with vegetation, flowing water, and animals. If this is the case, that would mean that after numerous meteor impacts, part of the luminous ceiling would begin to be exposed, and the light from within this structure would be visible from the outside, according to Wilcock. Personally, I have considered a number of possibilities. 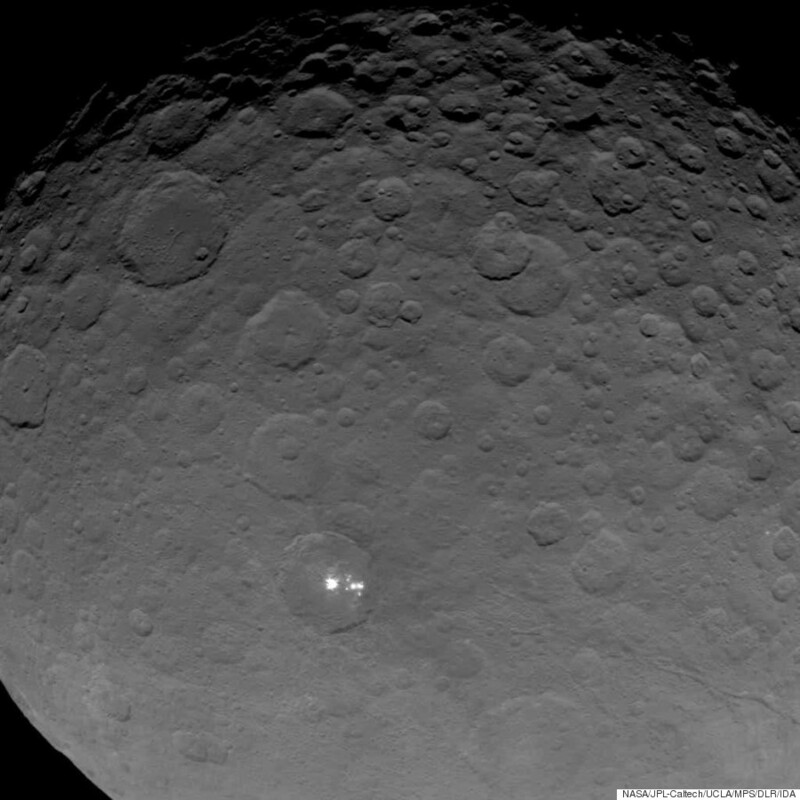 One image we find on the BBC website depicted a close-up image of the bright spots of Ceres, and as we can see, this clearly defines a domed, pentagonal structure housed within the largest spot on the planetoid. In a previous article, I presented this as the true nature of the spots. However, I do consider the possibility that those images may have been slightly altered for the sake of giving a subtle hint at the truth behind the spots. Whatever the true nature of these extra-planetary bases is, I consider these images extremely telling of the nature of the partial disclosure which is presently taking place. The discussion moved on to the subject of further evidence of the downfall of the cabal's financial infrastructure. For years now, we have been sold in image of the financial world as a fair, stable, and legitimate entity. However, after the crash of 2008, this viewpoint changed for many of us. After this massive failure, and the revelation of the crooked banking practices which caused the crash, the world would learn that the oligarchs held more power and influence than any governing body on the planet. We saw the ugly truth behind the deliberate mishandling of the assets of innumerable people, and yet after the smoke cleared, not one of these criminal conspirators faced major prison sentences. At that moment, the world was made aware of the fact that the system is rigged—though many still find ways to deny the evidence. Ever since this infamous crash, the illusion of financial normalcy has been maintained by the mainstream media, and this trend continued for quite a while. However, in 2015, things changed, and the long-awaited honesty from the corporate media began to be revealed. Two articles on this subject were mentioned during this discussion. These came from the website, The Telegraph. Their contents were not discussed in so much detail, but their implications were far-reaching. This image included in this particular article is fairly descriptive and indicative of the fact that the media is no longer sugar-coating the situation. No longer are they pretending that an economic recovery is possible. Instead, they are painting a grim picture of what seems to be the complete failure of the banking system which was originally said to be too big to fail. 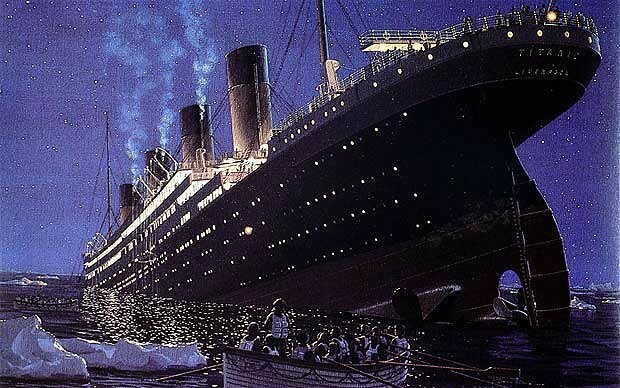 This was also reported to be said about the Titanic, making this imagery seem appropriate. According to Wilcock, these revelations present further evidence which suggests that the cabal is out of time, out of money, and running on fumes. In my view, there is no reason to even bother with the financial game of Monopoly any longer. The ship could sink or float and it would mean virtually nothing to those who were no longer interested in pretending to be rich or poor. However, I do understand that many people see themselves as having quite a bit to lose, and though it may be a shock to have such a monumental change as a complete change-over of financial functionality, this may be the way the situation is resolved. Wilcock goes on to further prove the point of this downward spiral of the cabal's financial dreams. This second article from the Telegraph actually admits the fact that debt itself is the main wait which is pulling the ship under. The world is sinking under too much debt and an aging global population means countries' debt piles are in danger of growing out of control, the European chief executive of Goldman Sachs Asset Management has warned. Andrew Wilson, head of Europe, Middle East and Africa (EMEA), said growing debt piles around the world posed one of the biggest threats to the global economy. "There is too much debt and this represents a risk to economies. Consequently, there is a clear need to generate growth to work that debt off but, as demographics change, new ways of thinking at a policy level are required to do this," he said. Upon reading the seemingly small perspective of the quote included within the article, it would seem that those who hold such dependency upon the system have little intention of looking outside of the system for the true solution to the problem of debt. Seeing that the majority of American citizens will not be able to pay off their debts before they die, it becomes easy to see the fact that simple job creation will do absolutely nothing. This commentator seems ignorant of the fact that the system is designed to create the problem he is trying to solve, and that as long as the system is in place, the debt will remain. It may also be that the executive at the Telegraph do not want to suggest any possible solution which would be detrimental to the cabal's infrastructure. Beside this, I can see no reason why such an apparently insane perspective—encouraging the perpetuation of the exact same system which caused the problem in the first place—would be suggested. Money is debt, as anyone who is familiar with the central banking system will realize. Money, as it presently stands, cannot exist without debt. If an expert is telling you that making more money is the solution to solving debt, they may either be unaware of the true situation, or they are lying. Either way, I liken this to the first explanation we received on the subject of the Ceres. There is much more to disclosure, but the media will not admit the facts outright. This is how the cabal intends to attempt to save their image—by hoping the public won't realize the true scope of their crimes. The discussion moved to a topic which was discussed in the previous episode. As Wilcock states, there is a good reason for the review. There was one quote which he read from the AntiMedia website on the degradation of popular music. Here is that article. From a political standpoint, all this ‘dumbing down’ makes sense: indoctrination creates obedience. If music and culture focus on mindless diversion, and education lacks, well, education, then people lack the acuity necessary to question the absurdity of the system. David Wilcock reiterates the fact that music is not at all what it seems. All of the variety that we believe ourselves to be exposed to actually consists of a few different companies pumping out propaganda to maintain psychological control over their audience. The key to this point focused upon one of the personalities included in the above image. The woman on the left goes by the stage name Iggy Azalea. 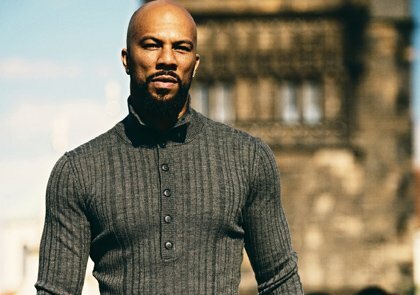 Wilcock points out the fact that Iggy's tour was officially canceled just nine days after this article was published. (The article was published on May 20, 2015.) This cancellation shows us further evidence that the public has caught on to the cabal's propaganda machine, so much in fact that the popularity of their entertainment spokes people are losing popularity. In her short career, Iggy seems to have attracted more criticism than popularity. Following the cancellation of her tour, we may recall the attempts by the corporate media to save the image of the character of Iggy. However, their efforts do not seem to have done much good. Let's examine why. 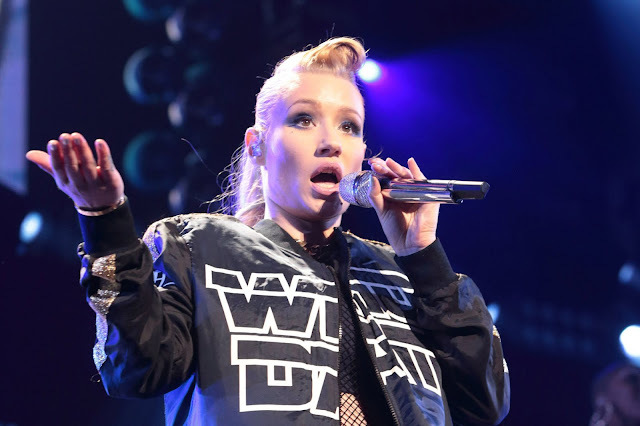 The 6 reasons why Iggy Azalea cancelled her tour – More damage control by cabal interests? This is not at all to say that the authentic, intelligent, non-infiltrated version of Hip Hop music cannot be accomplished by an Australian, Caucasian woman. I think that it could, and if it were, I think it would be an inspiration to other authentic musicians. However, Iggy does not seem to be authentic. Though the corporate media constantly attempts to assert that she is, and that she is an inspiration, but the public does not seem to be buying this notion either. Once again, I find myself feeling relieved to see a subject matter covered which I have observed for some time now. The situation of Iggy gives us an important clue into the reality which the cabal has attempted to distort. Though I do not like specifically covering issues of what modern society refers to as “race” (mostly because it have been used as a tool of division), I find it helpful to explore these concepts, and to learn how they have been used to manipulate us. Many of us have likely noticed the recent trend of superimposing the Black, Hip Hop culture over a Caucasian image. It is not that this would necessarily be a “bad” thing if the trend happened organically. However, in the context of cabal-manipulated entertainment, I strongly doubt this image manipulation was done for the sake of positive development. As it stands, many of the most skilled artists want nothing to do with the corporate world. Consequently, the ethnic diversity that exist within the real environment of Hip Hop has been eliminated from the corporate image of the genre, and replaced with an overtly negative image of minorities which promotes the cabal's view of all aboriginal decedents as inferior. 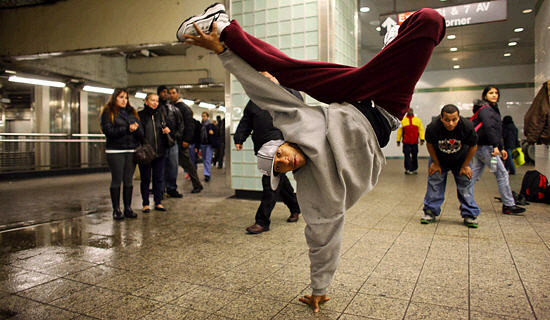 Considering the cabal mindset, the superimposition of Hip Hop culture on paid actors seems to have an agenda behind it. When viewing such media, I cannot help but be reminded of the centuries of cabal-initiated imperialism and exploration of the continent of Africa. This land was one of amazing abundance—numerous resources, land that seemed to stretch on forever, and even held ancient artifacts and technologies left by E.T. 's who visited ages ago. To the predecessors of the cabal, this continent had it all, but there was one problem. There were people in the way. To the cabal, these people were inferior and primitive. They “wasted” the land by “failing” to turn it into a business venture, and worst of all, they did not come from the cabal bloodlines. This situation left these cabal exploiters with a huge business venture, as well as a country full of people to get rid of. The process would start through exploitation, through enslavement, and eventually extermination. 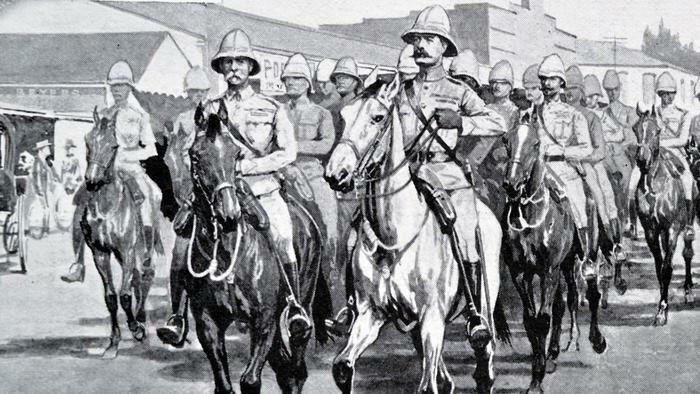 In short, their imperialist purpose included their typical method. First they use a people, then they take what they have, and finally, they wipe them out. (We have seen this during the American colonization, as well as during World War II, in Nazi Germany.) Many times, these steps are accomplished simultaneously. This method of exploitation has been used for centuries, and is still in effect today. The cabal has never left the picture completely. Their racist, sexist, genocidal philosophy is still as present now as it was centuries ago. It is very possible that this is the reason why we see the cabal-manipulated media using the same method their predecessors used. The purpose was not simply to wipe out African populations. The purpose was that when the time came, they intended to wipe out the African bloodline altogether. Fortunately, this has not been authorized, though this does not stop the cabal from trying to get this authorization through various violent acts, corruption of law enforcement, and corresponding media coverage. In every aspect of modern entertainment, we see the Illuminati belief system being superimposed over reality. In truth, our world is full of great diversity and variety, and this is both healthy and preferable for many of us. Along with this, it is my belief that equality is a universal fact. However, this reality is never reflected in Western media. Within every movie production—particularly films which are set in foreign countries and exotic locations—virtually every main character will typically fit the cabal's ideal for the “superior” bloodline. We have seen The Lion King, Tarzan, Prince of Persia, The Last Samurai, even productions such as Indiana Jones and James Bond seem to promote the idea of imperialism, and supposed superiority of the cabal's bloodline over every other country and ethnicity on the planet. In this way, the cabal has sent the message that they have been nothing but "heroes" and a "blessings" to everyone they have met. In the cases of some of the inventions of artificial rap artists, there seems to only be a corporate desire to exploit the origins of this culture, and then to do away with the people who invented it. 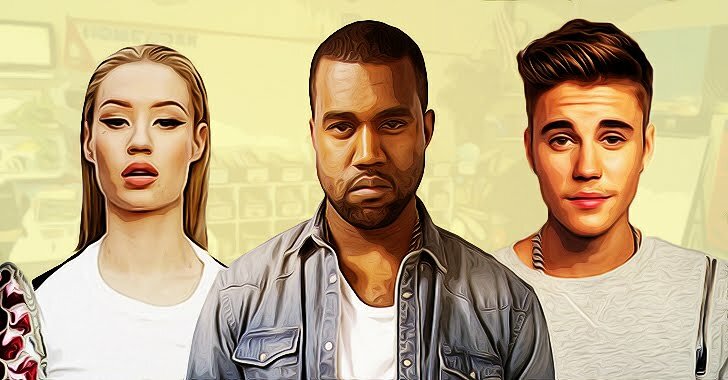 Just like every other exploitative scheme the cabal has come up with throughout history, it seems as though their only intent within the invention of Iggy, was to misappropriate the identity of others for nothing more than profit, and at the same time, to send the false message of their own belief system. Humanity is a unique and diverse experience. According to the Law of One, the original goal of divine Oneness was an experience with the greatest diversity possible. This experience is expressed in the form of a divine thought which spans the entire universe. Even on our small planet, this thought is immensely diverse. Within humanity, we can appreciate this diversity within our heritage, our languages, our place of origin, our appearances, our hairstyles, and the list goes on. It is my belief that with these differences, we receive the greatest benefit in our divine exploration of experience, and that these differences give us the greatest fulfillment when we come together as one. The discussion moved to the topic of the expiration of the Patriot Act. This act was the infamous bill which was part of an apparent effort to suspend the American Constitution, and to contort the identity of the United States into a fascist regime. As we may remember, there were a number of ridiculous and unnecessary changes which the Patriot Act imposed upon the American people. Among these was the implementation of domestic spying mainly focused around the NSA which, in my view, was one of the most ludicrous and definitively ridiculous aspects of these changes. Not only did it completely violate privacy of the entire country, but its reasoning was equally nonsensical. 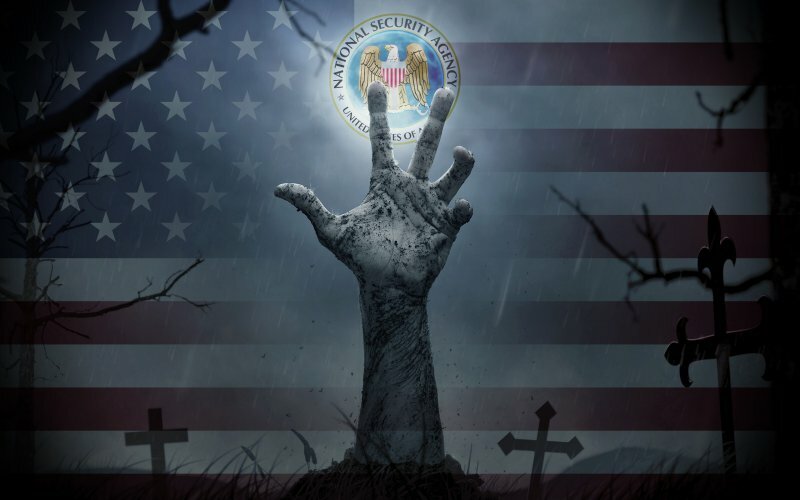 On the subject of the Patriot Act, David Wilcock covered what the headlines referred to as the “Zombie Patriot Act.” This was the retainment of the stipulation of the act which allowed the domestic spying program to continue even though the act itself expired. Upon reading this, it may be obvious to many as to the true reason why the domestic spying program is being continued. It was clear from the beginning that the intention was not at all to catch “terrorists”. Considering the fact that this data being collected was never used to stop any of the supposed terrorist acts which have taken place since 2001, this reasoning seems clearly flawed. According to everything that has happened since then, spying on every last human being in the country has proven to be pointless to everyone but the cabal. These criminals have been manipulating the system from behind the scenes, and they are afraid that if they don't keep an eye on everything that everyone is doing, they will lose their power. In fact according to many FBI employees, many of the terrorist acts were deliberately manufacture in order to justify the implementation of these spying programs. So when we hear the reasoning from the White House as to why domestic spying is necessary, it becomes fairly clear as to what the true reasoning is. The terrorists and the spies seem to be one and the same. The next topic may be fairly familiar to some of us. However, for the sake of being thorough, let's discuss it. On June 2nd, in 2015, an article from News.com.au featured a story on a monumental discovery which came not from professional scientists, and not even from a college graduate, but from a science student by whom no one might have expected such a significant discovery to be made. Here is News.com.au with the details. It’s a finding that was initially met with a considerable degree of scepticism within the field of astrophysics, but a University of Sydney undergraduate student Cleo Loi, 23, has proven that the phenomenon exists. By using a radio telescope in the West Australian outback to see space in 3D, Ms Loi has proven that the Earth’s atmosphere is embedded with these strangely shaped, tubular plasma structures. The complex, multilayered ducts are created by the atmosphere being ionised by sunlight. “For over 60 years, scientists believed these structures existed, but by imaging them for the first time, we’ve provided visual evidence that they are really there,” said Ms Loi, of the Australia Research Council Centre of Excellence for All-sky Astrophysics (CAASTRO). This seems to be the first time anyone has had the mind to look at the sky in this way (at least on the civilian side of science). As stated, Cleo Loi is an undergraduate science student. She is not a professional scientist, and compared to the entire staff and faculty who work at her college, she is under-qualified to make such a revolutionary discovery. Yet she has. Ms. Loi has discovered not only a new aspect of astronomy, but in doing so, she taught all of the professional scientists around her a new way of using their own radio telescope. Why does it take an undergraduate student to make this discovery? Where are the scientists in this situation, and what are they doing that their trainees are showing them up like this? The various branches of scientific study have a good deal of intelligence and professionalism among them. However, when it comes to thinking creatively for the purpose of making new discovers, it appears that at this professional level, there is not much creative ability left. It has proven to be extremely difficult to prove a point to an institution which resists change so thoroughly. As Wilcock points out, mainstream physics is missing the component of torsion science. This torsion physics is well documented within the classified world. The mainstream seems to trudge along completely unaware of how much the establishment has missed over the course of the last century due to the classification of such knowledge. Wilcock goes on to further state his prediction that the lines traced by these plasma tubes will be found to be incorporated into the global grid of the Earth, though he did express that to prove this point is a very intricate and disciplined process. Such a task would be multi-disciplinary and require quite a bit of explanation in order to be completed. However, considering all that I have seen, this process has already been proven by separate scientific disciplines. It is just that no one has yet combined these observations in a way which clearly defines the global grid. This can easily be accomplished. As David Wilcock mentions, this side of science is well-known within the world of classified science. Yet it is only now that it has come to the forefront of mainstream science. I honestly doubt that this student was the only one who had ever had such an idea within mainstream science. There may have been many more professionals who did. These scientists may even have known about torsion physics, but may have simply been afraid to come forward with their findings. 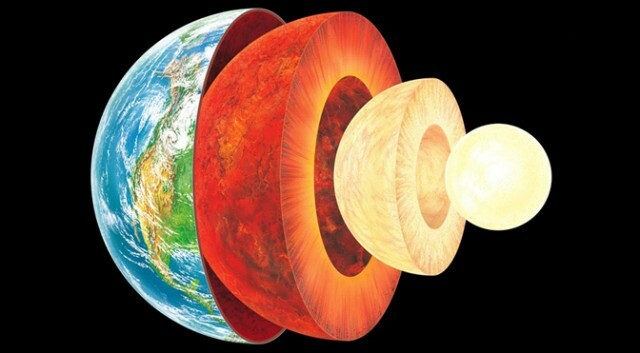 One point to note: The notion that the Earth's iron core as that which creates its magnetic field has been long-lived. However, this theory seems to be based upon flawed logic. Tests are currently being done to measure the magnetic fields generated within liquid metal systems, using molten sodium as the metal of choice. This may be interesting, but the point may be moot, as the element of sodium does not have a Curie temperature. (Simply put, the Curie temperature is the temperature at which metals lose their ability to hold a magnetic charge.) However, iron and nickel—the two elements said to compose the Earth's core—have Curie points far lower than temperatures found at the Earth's core. This would mean that according to scientific principles, there would be no way for the iron and nickel at the Earth's core to hold a magnetic charge. In this case, it seems that the scientific establishment may have contradicted itself on this matter. In my view, if this test involving molten sodium were intended to be valid, it would be proven with iron and nickel. This causes me to wonder what the thinking is with regard to spending so much time and energy on tests which don't seem to apply to the proposed situation. In my view, it seems much more sensible to conduct tests to better understand the possibilities of torsion physics as causal in the sustenance of the Earth's magnetic field. Now we come to the namesake of the episode. On the journey of partial disclosure, this has to be one of the most significant, one of the most revealing, and one of the most expensive (not to mention ridiculous) hints at E.T. life that the cabal has ever initiated. This is the kind of thing one has to see in order to believe. Here is the Daily Mail with the story. Since the atmosphere on Mars is so thin, any parachute that helps a heavy, fast-moving spacecraft touch down needs to be extra strong. The US space agency figured out how to do this decades ago, beginning with the Viking mission that put two landers on Mars in 1976. But with the goal of sending humans to Mars in the 2030s, the agency is now testing a more advanced, new generation of parachute technology, known as the Supersonic Ringsail Parachute, that could allow even heavier spacecraft — the kind that may have humans and months of food and supplies on board — to land softly. "We want to see if the chute can successfully deploy and decelerate the test vehicle while it is in supersonic flight," NASA's Jet Propulsion Laboratory said in a statement. Did you catch that? What did you think of the spectacle of this contraption with a chemical rocket strapped to the bottom? If you are like me (and Wilcock mentioned this as well), you are wondering why after all of the decades which NASA has been in operation have they never once built a rocket like this until now. There is absolutely no reason to build a contraption that looks like this, except maybe one. We see the excuse written in the article that this is not meant to be an actual rocket, but only a parachute test. Yet even still, the design makes absolutely no sense. NASA literally spends years on end studying the aerodynamic nature of any design they create. This is necessary in order to design efficient aerospace systems. Yet here, they seem to throw the entire book on aerodynamics out the window, and instead of building a rocket system as they always have, they build a saucer with an engine bolted on the bottom. This “design” has been used by NASA in the past. However, it was never used as a nose cone. By my observation, this general design has been used for reentry modules during the Apollo missions. 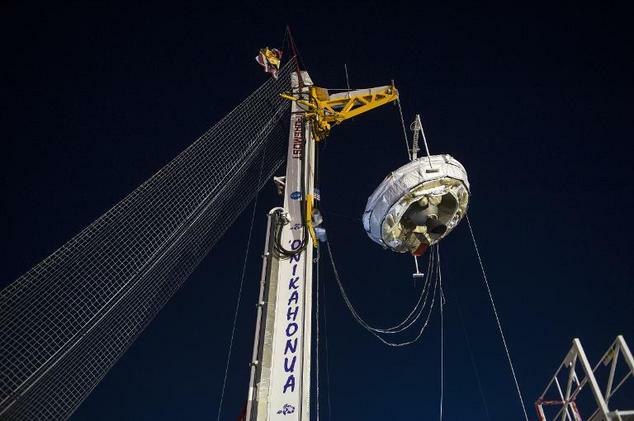 These reentry capsules are basically designed to create the most aerodynamic drag while enduring the steadily increasing pressure (and consequent heat) of the atmosphere so that the capsule can reach the optimal speed for parachute deployment. In no way does this form double as an optimal nose cone design. 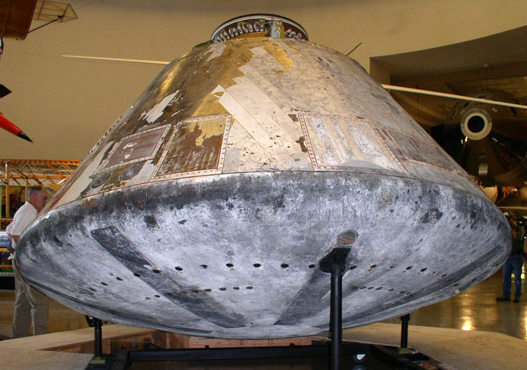 (Though the original Apollo capsule did actually double as a nose cone, but that involved completely reversing the trajectory of the capsule in travel. Note the conical shape juxtaposed to the half-disc shape.) 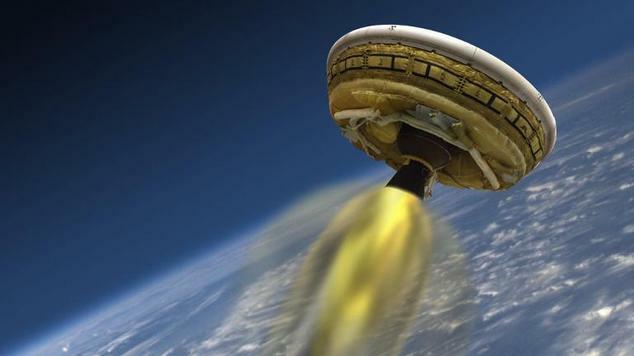 Given the form of basically all other NASA-designed nose cones, this saucer design goes completely against any practical application for aerodynamic efficiency. To get a better understanding on the matter, here is a short definition from Wikipedia on the main goals of nose cone design. Given the problem of the aerodynamic design of the nosecone section of any vehicle or body meant to travel through a compressible fluid medium (such as a rocket or aircraft, missile or bullet), an important problem is the determination of the nose cone geometrical shape for optimum performance. For many applications, such a task requires the definition of a solid of revolution shape that experiences minimal resistance to rapid motion through such a fluid medium, which consists of elastic particles. The complex task of reaching escape velocity compared to the task of safely descending to the Earth surface from orbit are like night and day. They have little or nothing to do with one another at all. A nose cone is designed to minimize drag during the rapid ascent of a rocket up to escape velocity, while a reentry module is designed to basically be an artificial meteor which is able to protect three people from the pressure and heat of the reentry process. Considering the extreme differences between these two components, we can easily conclude that they are not at all interchangeable. So with regard to the explanation which NASA gives as to the reasoning behind this rocket design, we have little to no reason to believe their story without scrutiny. With this in mind, the question becomes: "Why was this design used as a crude nose cone to begin with?" According to David Wilcock, the purpose of this rocket tests was not at all for testing parachutes or any other reason that NASA gave (or at least this was not the only reason). This test was done for the sake of creating a public spectacle and to send a subconscious message to prepare the public for the reality of flying saucers, and by my observation, this was one of the most expensive and nonsensical ways to do it. The finale of this episode consisted of some rather bizarre information on the planetoid Pluto. This disclosure came to us from the website Wired.com, and within it, we receive information of some revealing facts of the proof of many principles within alternative science. More curious than that, however, may be Pluto’s moons’ orbital configuration. The ratios of their orbital periods (the amount of time they take to complete their orbit around the Pluto-Charon pair) are very close to 1:3:4:5:6. That simple integer ratio is called the Laplace resonance—a gravitational relationship seen in Jupiter’s moons Io, Europa, and Ganymede, which have a period ratio of 1:2:4. Aside from being mathematically cool, the Laplace-like resonances seen around Pluto narrows down some of the possibilities for how the system formed. In the past, the relationships between the moons’ movements may have been more perfectly aligned, until they were knocked slightly out of place by some unknown force, speculates Scott Kenyon, an astrophysicist at the Smithsonian and author of an accompanying Nature article commenting on Showalter and Hamilton’s study. The probability that this relationship developed by chance, he says, is very slight (about 1 percent). There is a fairly extensive situation, but the gist of it is as follows. Two new moons of Pluto have been discovered. These are Kerberos and Styx, and there are two aspects of these moons that are extremely unusual. The first is that the orbits of these moons follow a specific harmonic of orbital frequency. This harmonic cannot be accounted for by simple centripetal and centrifugal forces alone, and may suggest that there is some type of geometry that sustains this harmonic. 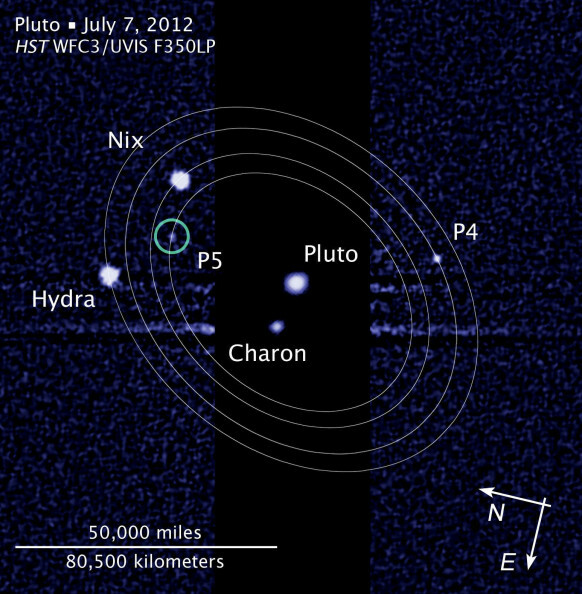 The second strange phenomenon on the subject of Pluto was relative to the moon Kerberos . As it turns out, this moon is actually jet black in color (though the image depicts it as luminous due to the specific imaging used to view it). As Wilcock states, there are no other jet black objects in our system. This seems to be the only one, which may suggest that the object is artificial. If this is the case, this may mean that Kerberos was intelligently piloted and actually steered into position similar to the way our own moon was said to be positioned. As David Wilcock explains, the movie 2001: A Space Odyssey features another artificial object in the solar system. This object is the monolith, which also happens to be jet black. This point is further stated in the sequel to the movie which was 2010: The Year We Make Contact, when multiple monoliths of jet black material are found throughout the solar system. These movies may have been some type of soft disclosure of what was already found to be out in space. As we have traversed the various sites along the journey of soft disclosure, we have been exposed to quite a bit. Were it not for the numerous verifiable whistle-blowers telegraphing the entire process ahead of time, we may not have been aware of the true message behind these disclosures. As mention before, David Wilcock actually ruined the plans of the Lower-Level SSP by disclosing so much of those plans on stage. This presentation included multiple aspects of classified science, galactic evolutionary processes, and multiple other aspects of classified, SSP operations. These Secret Space Program operatives actually brought Goode into a disciplinary meeting because at the time, they thought that it was he who gave Wilcock this intelligence, but it was not. Goode was on a need-to-know basis, and this information was still secretive. However, Wilcock actually received the intel from other sources and didn't know that this would spoil any plan. Fortunately for all of us, it did, and we do not have to deal with this extra aspect of partial disclosure. However, we do still have the cabal's attempts at their campaign of half-truths to thwart, and with the proper help, this won't be too difficult either. So there we have it. Though we may keep in mind that even though these disclosures signify monumental changes behind the scenes, this news comes to us from 2015. This brings to mind the possibility that a disclosure of some sort may happen at any moment. 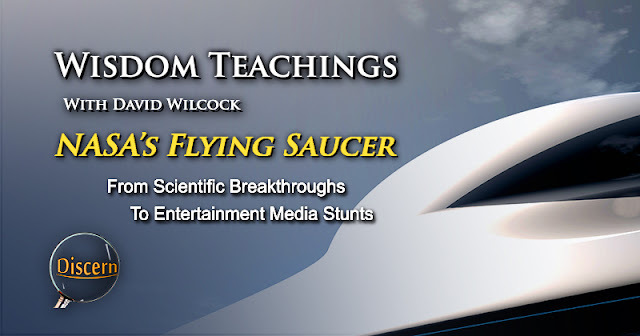 As Wilcock has stated numerous times, the move for partial disclosure will likely be made only when the cabal has no other choice than to spill their greatest secret (short of their own criminality). This disclosure-card represents the relinquishment of the last remnant of the cabal's financial power, and they realize this. They know that once the world knows what they have done, there is likelihood that they will never be trusted again. These criminals realize that their chances of coming out of this situation on top are slim to none. This is why they are waiting. It is why we have been waiting for this moment to arrive. However, there is an upside to the situation. Many of us have become anxious with regard to planetary change and liberation, and this is understandable. However, there is actually a very simple solution to the issue. Would you like to know what it is? The solution is this. It is that everything we see, everything we experience within our personal life and within our world as a whole is nothing more than a reflection of that which is happening within our inner selves. Again (as this cannot be overstated), that which is happening on the outside is a direct reflection of what is happening on the inside of each of us. If we see starvation, this reflects an inner aspect of ourselves which we have not provided for, and which does not have what it needs. If we see violence and death, this means that there is a certain aspect of ourselves which we have abandoned, abused, and basically left for dead. If we see corruption beyond measure caused by lack of attention, this may translate to our own lack of desire for self discipline and ethical integrity, and that instead of these things we have chosen self-righteousness and hypocrisy. Most importantly, if we see stagnation within world progress toward freedom and revolution, this may mean that we as individuals have chosen to stand still in our own lives, and to wait instead for someone else to fix our problems for us. These internal choices and conditions within each of us have combined to create the world which we see. However, this is easily reparable. The simple and easy way of completely revolutionizing this planet is to look within ourselves, and to start becoming the person we have always known we could be. This means that we are to start taking care of ourselves. It means doing away with that which we know to be unhealthy for us, letting go of old control issues—whether they be to control others or to be controlled by others. It means forgiving ourselves for our mistakes and forgiving others theirs. It means taking an honest look into the mirror and being unafraid of what we see, and it means having the faith within ourselves and within all goodness that there is nothing we cannot accomplish. It becomes more and more apparent every day that something spectacular is coming to our conscious experience. Our world will not be the way we see it, and our collective choice is guiding this newness to us. By my observation, we have some amazing experiences in store for us. Until then, we have a few issue to take care of, and some self-healing to complete. This process is easy. It is the way things are supposed to progress to our ultimate breakthrough. However, it requires maturity. It requires courage, initiative, and awareness of self. Most of all, it requires the sight to see beyond the present into the world which we want to see, and which is being created before us. Let's finish the work, and let go of the old energy of 3rd density. It's time to graduate, but finals come first.